Sprout believes that a meal is more than nourishment. It’s a chance to inspire and grow together. That’s why we are committed to introducing an early love of healthy, whole organic foods to children everywhere. Research shows that starting babies on healthy foods early in development helps foster healthy eating habits through life. That’s why we’ve crafted a variety of fruit, vegetable, & grain blends that help babies adapt to new flavors and textures and provide greater exposure to wholesome foods. All of our Stage 2 organic baby food purees are USDA Certified Organic, Non-GMO, and contain no concentrates, additives, or fillers of any kind. SPROUT'S COMMITMENT: Sprout is committed to using whole foods, not from concentrate, and reducing the processing steps to keep our recipes as close to how mother nature intended - right from the earth. We procure ingredients from only certified-organic growers to ensure the cleanest recipes are delivered to your family. 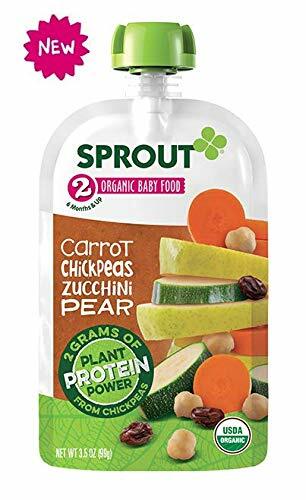 Sprout Stage 2 Organic Plant Protein Baby Food purees are made from whole foods and contain no concentrates, additives, preservatives, or fillers of any kind - only real, honest, and pure ingredients. If you have any questions about this product by Sprout, contact us by completing and submitting the form below. If you are looking for a specif part number, please include it with your message.